In Alison Bechdel’s new memoir Are You My Mother?, the cartoonist recalls a page from Dr. Seuss’s Sleep Book that captured her imagination when she was a little girl. It’s a drawing of a typically Seussian creature, working a typically Seussian machine, inside a Plexiglas dome. Bechdel describes this as a “perfect environment,” and says that she spent a lot of her youth drawing similarly perfect environments, imagining what it would be like to live in a well-stocked bubble, cut off from the rest of the world. Which puts Bechdel in the company of, oh… roughly 100 percent of the people who grew up reading comic books. And probably 90 percent of the people who didn’t. What is it about the lair, the clubhouse, the secret room? And why do comics—and children’s books, for that matter—“get” the allure of the lair better than just about any other medium? Television copped a little of the Swiss Family Robinson appeal in Gilligan’s Island, with its huts full of handmade luxury items. Community has also frequently tapped into that part of the viewer that loves to burrow, in the episodes that have showcased Troy and Abed’s flair for building forts and hideaways out of pillows and blankets. Breaking Bad has had its underground and mobile meth labs, just as The Man From U.N.C.L.E. and Get Smart had their ordinary doors that led to extraordinary spy-fighting headquarters. And Joss Whedon’s Angel was one of the most lair-tastic shows on TV during its run, with the show’s vampire detective taking up residence in haunted hotels and evil law firms, each outfitted with arsenals, gadgetry, and secret passages. Meanwhile, in the real world, the “micro home” trend has married environmental responsibility to human ingenuity, spawning newspaper think-pieces, photo-spreads in architecture magazines, and a seemingly endless succession of YouTube videos showing how people squeeze all of their possessions into tiny spaces. Wealthy survivalists are now offering luxury condos in which families can ride out the apocalypse in style. And lifelong adolescents Hugh Hefner and Harlan Ellison have reportedly built their houses with hidden doors and nooks, living out their childhood dreams. It does start in childhood, this fascination with tucked-away spaces, both big and small. There are few more coveted toys to a group of 8-year-olds than an enormous cardboard box, which can be cut up, taped up, marked up, and turned into a home within some kid’s actual home. Then inside their paper citadels, young people break out spiral notebooks to sketch even larger hideouts, detailing where their seaplanes will dock and where the ping-pong table will go. Or they read books like Mrs. Frisby And The Rats Of NIMH, poring over the pages where the super-intelligent lab rats take Mrs. Frisby on a tour of their technologically advanced colony; or From The Mixed-Up Files Of Mrs. Basil E. Frankweiler, in which two kids make a home for themselves in the Metropolitan Museum Of Art. Or they read comic books. 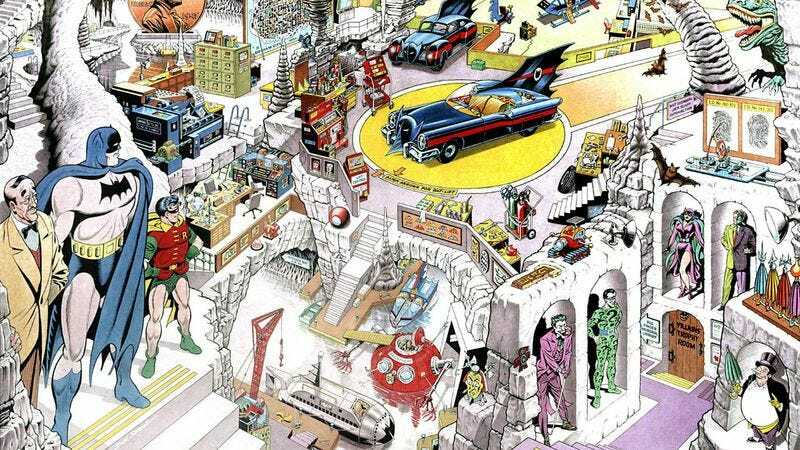 Superheroes are likely the first thing people think about when they think about secret lairs in comics, although a generation of alternative cartoonists raised on superheroes and lavishly illustrated children’s books have been drawing stories for years that use maps, blueprints, and schematics to reveal the spaces where their characters live. Chris Ware’s upcoming Building Stories collection looks like it’ll be the ultimate “let’s look inside this structure” comic, spread over multiple pages, with a narrative winding through the cutaways and cross-sections. Until that book comes out later this year, Dan Zettwoch’s graphic novel Birdseye Bristoe should suit those art-comics fans with a fetish for tiny identifying labels. Depending on where DC is in its reboot and retcon schedule, its universe has featured the likes of the Batcave, Titans Tower, and the Justice League Satellite, the latter of which keeps watch on the people of Earth via a bank of screens and whichever not-that-busy hero has drawn “monitor duty” (usually Green Arrow). But the greatest lair in the DC Universe—and the greatest in all comic-dom—is Superman’s Fortress Of Solitude. Beyond having an awesome name and being situated in an Arctic mountain range—pointed to by a giant key so heavy that only Superman can lift it—the Fortress is fascinating for what it reveals about the Silver Age version of The Man Of Steel. The Superman of the late ’50s and early ’60s doesn’t spend all his time battling supervillains and helping the helpless; he also stocks a zoo, tinkers with robots, and builds rooms honoring all the special people in his life (including Clark Kent, just in case someone breaks in and wonders why Superman’s “best friend” doesn’t rate any souvenirs). That’s a powerful idea to plant in the head of a young comic-book reader: that even the most powerful person in the world has the time and the need to build a little fort, and to stock it with his stuff. There’s a terrific Paul Chadwick Concrete eight-pager called “Byrdland’s Secret,” based on Chadwick’s own visit to Harlan Ellison’s house of wonders. Throughout the piece, the enormous, rocky human-alien hybrid Concrete inwardly compares his own life to the Ellison-like writer Dwayne Byrd, whose accomplishments and passion put Concrete to shame; and Chadwick illustrates Concrete’s thoughts by showing people hosing off sidewalks and trucks shedding tire tread, creating a visual motif for what gets left behind and what gets washed away. At the end of the story, Concrete agrees to help some neighbor kids construct an earth-sheltered clubhouse, and while he’s focused on foundations and safety, the children want to do the decorations first. And who can blame them? The whole fun of a lair is personalize it, reducing life to its necessities. Here’s the pantry, stocked with a lifetime supply of Coke and Little Debbie Fudge Rounds. Here’s the TV, which can get show any baseball game in the country at any time. Here’s a deck of naked-lady playing cards. Here’s where the jetpacks will go someday. And here’s the library, containing every issue of World’s Finest, bagged and sorted.